It is time for Hollywood to understand that the stories of Dr. Seuss only work as 20 page children’s books, and not in feature length form. As Christmas time approaches once again, the irascible and forlorn Grinch (Benedict Cumberbatch) plots to steal Christmas from the Whos of Whoville. 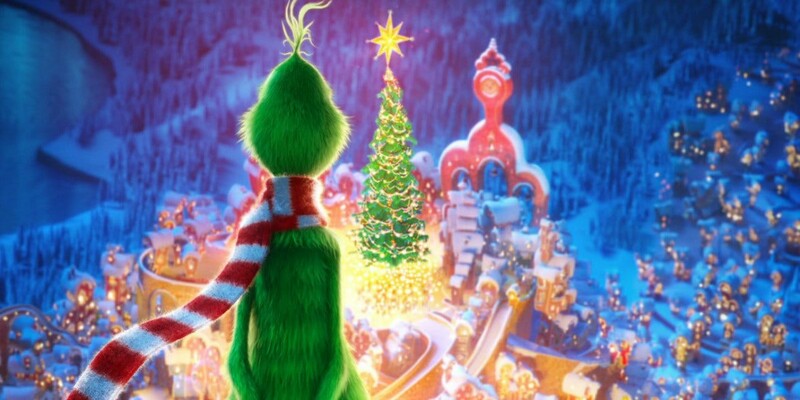 “The Grinch” follows the same formula as the “How the Grinch Stole Christmas” incarnations before it, stretching out what little amount of story there was in the original story into a dull and joyless 90 minutes. It is evident that the film is lacking in substance because it just barely reaches that 90-minute minimum time limit and is forced to stuff itself with unamusing Grinch hijinks that serve little purpose to the plot. There is a portion of the movie where the Grinch ventures out to find a reindeer to aide him in his plan to steal Christmas. He captures one, and it ultimately serves no useful purpose in the movie. The reindeer has a few gags, then the Grinch releases him in a moment of character development that was not even necessary to the film and then it shows up right at the end. This entire subplot and reindeer character could have been removed without any major effects to the movie, but “The Grinch” would have only been 75 minutes without it. Unfunny gags and non-jokes reign galore in this adaptation. There are a lot of weird and unfunny slapstick bits, like the Grinch getting accidentally punched in the face by a Christmas decoration. There are no jokes, just supposedly funny things with no setup or reason to them. Apparently a reindeer spraying whipped cream into its mouth is supposed to be hilarious. In terms of its presentation, the animation is wonderful while the voice work is ill-fitting. The film is aesthetically gorgeous to look at, especially the Grinch’s hair and the snow. The same cannot be said about the voice work, though. While Benedict Cumberbatch is not necessarily bad in the role, his voice does not sound like what the Grinch should sound like. His tone is too calm and pleasant, with the only evidence of the character being grumpy coming from his dialogue. Alongside Cumberbatch, the narration by Pharrell Williams nor the original songs by Tyler, the Creator fit either. What differentiates a good family movie from a bad family movie is how it treats the audience. A family movie should be understandable but not too simplistic for a younger audience while also not being boring and irritating for an older audience. “The Grinch” falls right in the middle of these requirements, rendering it a passable family movie. An older audience will probably be bored by this one, and perhaps mildly irritated by the bad humor, but it does not over-simplify the message or the characters for the younger audience, and through that could be at least tolerable for whatever older person has to watch it with a child. “The Grinch” might be a dull adaption, but at least it is not an offensive one. One thing that an adaption should do is provide a new take on pre-existing material. While “The Grinch” does not do this for most of the movie, it at least takes a somewhat different approach to everything at the end with the Grinch’s character. Unlike other versions of the story, the audience actually gets to witness the Grinch’s personal reaction and self-awareness to his actions, which serves to flesh him out and add some depth, and it makes the story’s ending a bit more meaningful. It is not very memorable or interesting, but in terms of movies based off of Dr. Seuss’ work, it is one of the better ones.